This entry was posted on June 8, 2010 at 1:00 pm and is filed under General search, Internet Yellow Pages, Local Search, Small Business. You can follow any responses to this entry through the RSS 2.0 feed. Both comments and pings are currently closed. very interesting stuff…I am more than curious how the automated optimization tool will optimize for the performing keywords. Would this mean increasing the bids, splitting of ads to relate to just that keyword and associated kws? Wow. So they are trying to catch up with ReachLocal!!! Was unaware. I know Reach did/does call tracking but do you also do keyword and/or campaign optimization on that basis? This is what they’re saying: using calls to drive automated optimization. Reach local ties a call to the keyword via a timestamp. Making the assumption that if a call happens within a certain amount of time after a click, it is that click that must have generated the call. A fair assumption but not very exact for obvious reasons. Meaning if someone cliks thru to a site but doesnt call till an hour later the wrong click would be attributed with the call. Any optimisation based on this would be problematic. The only alternative and maybe what Kenshoo is atempting is to provision a seperate number for each keyword. You would need an exponential amount of numbers and would likely need to retard the number of keywords used. Bigger problem here… we currently have a groundswell of merchants anti the use of call tracking numbers, how are they going to feel about hundreds of numbers being used. And who would that number be associated with the next time a consumer calls it? The automation of campaign optimisation, increasing/decreasing bids, removal of keywords, moving budget to better performaing campaigns and keywords etc has been solved by a few companies for a while (Marchex, Matchcraft, Reach etc). That is not where the challenge is. Tying the call to a click without the use of an onsite events (mouseovers or click-to-call) is the challenge. Out of my own knowledge set here so forgive me but couldn’t the technology exist to have session tracking with analytics involved to see the referring search term and only one phone number to call? Century Interactive in Dallas has promoted an interesting product that offers both fixed number and number pools for it’s clients. I just can’t see how needing to have a number pool would be necessary this day in age. Sorry I didn’t read into your response further Jake…I guess that time-stamp is about the best you can offer with just one number. Interesting discussion. I am the Director of Product Management at Kenshoo Local. Hopefully I can shed a bit more light on what we are doing in terms of Call Conversion Optimization. As noted above, we’ve integrated our campaign management and bid optimization platform with several leading call tracking providers. This enables our clients to easily link their ad campaigns to their call tracking accounts and use our bid optimization system to improve campaign performance. Some clients optimize to generate “more” phone calls, while others optimize to generate “higher quality” or “higher value” calls, depending on their goals and unique capabilities. 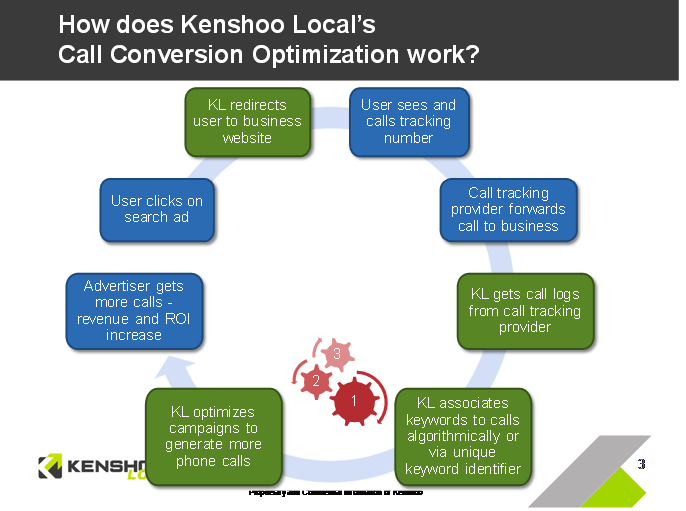 “Unlike systems that use fixed numbers and time stamps alone, Kenshoo Local can apply unique tracking numbers, fixed or pooled, at any level of the ad campaign structure, i.e., account, campaign, ad group, and/or keyword and can ultimately track the calls back to the associated keywords. Hope this helps.